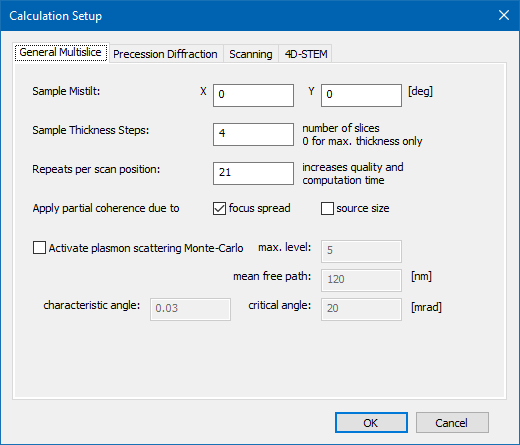 The calculation setup dialog as shown in the screen shot below allows input of parameters relevant for multislice calculations in general and for specific calculation schemes such as precession tilt and scan image simulations. Accordingly, the dialog	is separated into 3 sections. Closing the dialog with the [OK] button acknowledges the current input and applies the parameters. Closing with [Cancel] or the [X] in the upper right corner discards any changes made to the parameters.